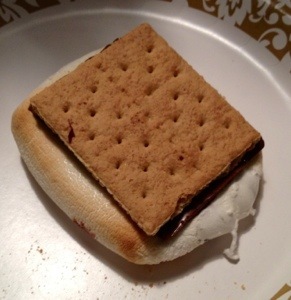 The Good News: My honey made the most perfect s’more I have ever seen! The Bad News: I ate the whole thing!! The Good News: I worked out in the BBH gym with Lynn & Jeanie today! The Bad News: I could not keep up with them! I was the first one to quit my workout. But next time I’ll try to last a little bit longer! The Good News: Chef Shannon cooking in the BBH kitchen today! Enjoyed hanging out with her in the kitchen while she cooked and am looking forward to having “Coconut Crusted Salmon” with coconut curry sauce & brown rice for dinner! The Good News: Sleeping in till 7:30 am & not getting out of bed till 8:00 am! The Good News: I got to worship & praise the Lord in the early service at Denver First Church today! We usually go to the second service so this was a treat! The Bad News: No Sunday afternoon nap! More Good News: We went to Ft. Collins with our friends to see Brian Regan at the Lincoln Center. He is so funny and he uses NO profanity in his act! What a novel experience! Fun! The Bad News: I learned that I should NEVER buy tickets for an event from a third-party vendor…..OUCH! The Good News: Today we went to the Rockies vs Pirates game at Coors Field with a group of friends. Everyone in the group was supporting the Rockies except Redgie & I (who are Pirates fans.) We ate Rockies Dogs (brats with sautéed peppers & onions) and had a great time catching up and visiting with our friends. The Good News: Redgie was traveling home from his business trip today. His flight was overbooked so he volunteered to give up his seat. As a result he received a $425 travel voucher from USAIR, got on a United flight that arrived home sooner than his original flight and was upgraded to First Class! Wow!